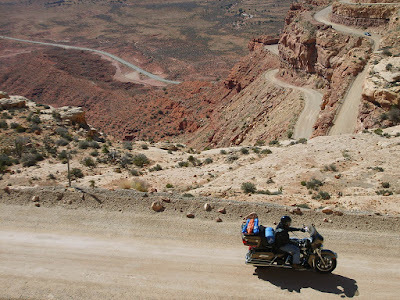 That last motorcycle camping trip to Utah, I tried to document on Twitter. Part of my goal was to generate interesting content on Twitter. Much of what I've found on Twitter is just junk. I'm just as guilty as the next guy, posting photos of my beer, or telling people I'm bored, or informing my followers what television show I'm watching. 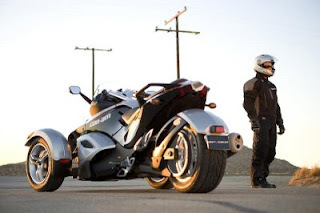 So anyways, I figured if there are any motorcycle riders following my Twitter feed, the maybe they'd be interested in seeing the motorcycle ride as it happens. Maybe I'd end up doing something useful with Twitter. In a sense, it's still the same useless junk everyone else is posting, like photos, and telling people where I'm at. 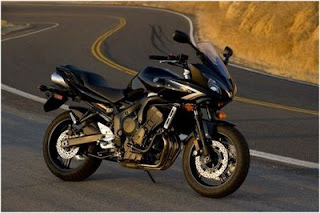 But if you're a motorcycle rider, you might get some sense of riding along with me. But as it turns out, it's not all that practical. While we were on the Interstate, I could at least get network access. But once we got into remote areas of Utah, I had no access. I saw some awesome scenery, but couldn't share it with you. I could still take the photo, and save it for later when I came into access. But often times I'd forget because I was enjoying the moment with my friends. Then there is peer pressure. At every stop, I'd pull my Blackberry out, and snap a photo. Then I'd take some extra minutes to e-mail it to Twitpic, and include a description. The other guys in my group kept chiding me about having to blog at each stop. Someone would ask, "Are we all ready to go?" And someone else would say, "No, Steve hasn't finished blogging". But as far as Twitter goes, you only get that 140 characters to say something. And that just isn't enough to describe the thrill of the road, and the splendor of Mother Nature. I actually did set up an e-mail address for this very blog, and I did submit a blog post through that address, which appeared here. But composing an article on a Blackberry keyboard is not very elegant, especially on a touch-screen keyboard. It can be done, but you have to be patient. But how much patience can I have when my buddies are around the campfire, eating hot dogs, drinking beer, and laughing it up. I'd rather join in on the comraderie than trying to compose an article. 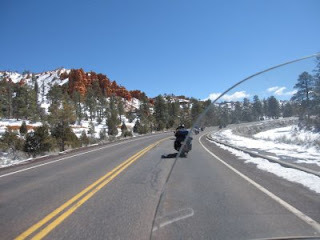 Using Twitter or E-mail Blogger to document your motorcycle ride works best when going solo. 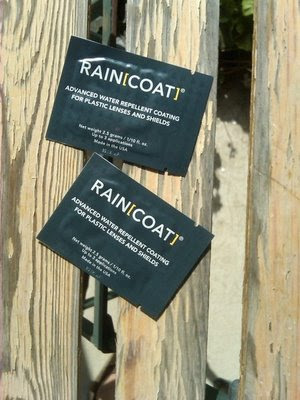 Has anyone tried this stuff called, "Raincoat"? Looks like we're going to get rain and snow on this motorcycle camping trip to Utah. So I decided to apply this to the windshield of my Ultra Classic, hoping it'll make the water drops roll off. This stuff looks and feels like Turtle Wax. You rub it all over the windshield, let it dry, and then buff it off. It cost me $0.99 per packet at my local CycleGear. The company that makes this stuff, MotoSolutions, says it's safe for Lexan, plexiglass, polycarbonate, etc.